Here at chateau Watson, we are on a feeding frenzy. Having family in always means hitting our favorite restaurants night after night and splurging on extra drinks and dessert. Throw in a birthday and a massive chocolate cake and you'll see where I'm going. Now even after family has departed, the butter binge has continued. 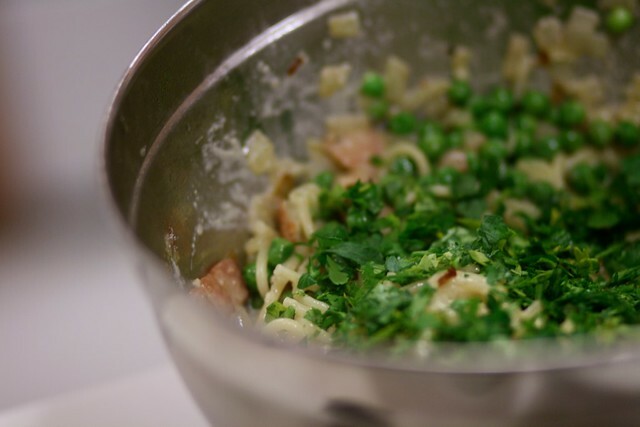 Let's blame the weather, blame the lack of groceries purchased this weekend or just total lack of self-control that has led us to the point we were at last night while scraping every last bit of carbonara out of the pot while sitting on the sofa catching up on Dexter. 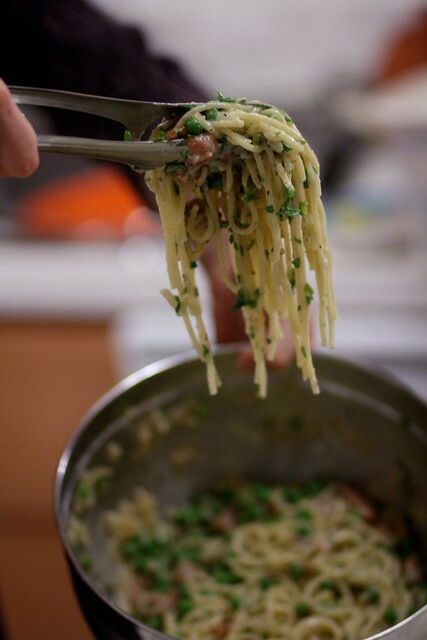 Typically a single batch of this pasta perfection feeds us both with enough left over for at least one lunch the following day, but I'll be heading out to pick up lunch because every last noodle was slurped, and boy, oh boy, were they ever good. Make this now. 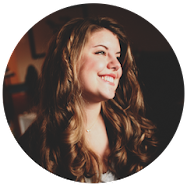 Make it because it's winter and your wardrobe can still consist of bulky sweaters and leggings for another few months. Make it because you want to eat the gastronomic equivalent of a warm blanket and a nap on the couch. Make it because you probably already have all the ingredients, and it's too cold outside to run to the store. Just don't blame me if you eat it all. Put a large pot of salted water on to boil for the pasta. Once water is boiling, add pasta, follow package directions, cook until al dente. Meanwhile, fry sliced bacon in a skillet. Once starting to crisp up, add onion and continue to sautee until onion is translucent. 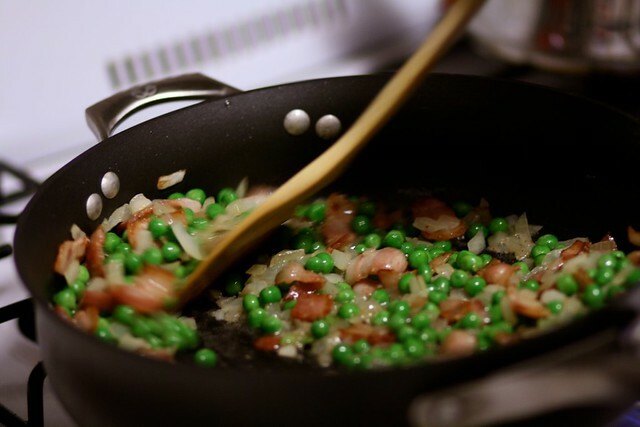 Add peas, cook until thawed. 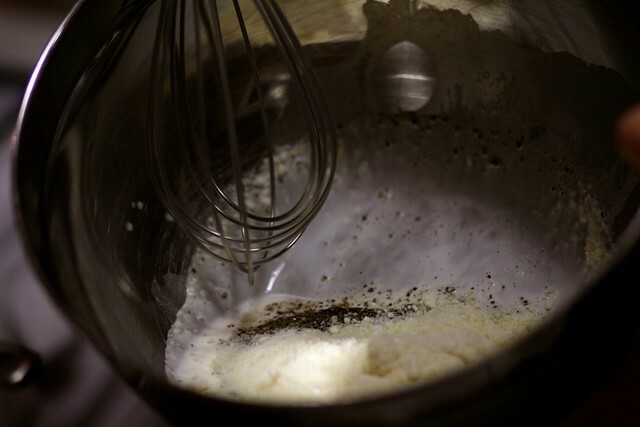 In a large bowl whisk together eggs, cream and parmesan with pepper. 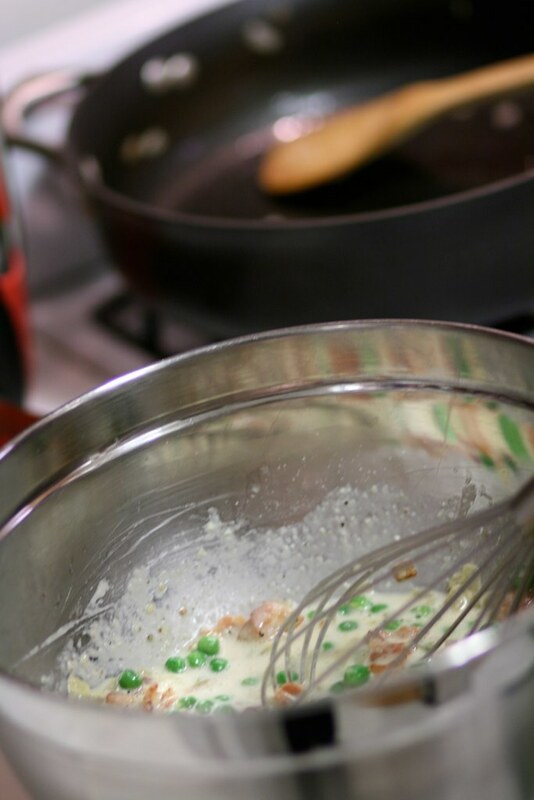 Add cooked bacon, onion and pea mixture along with any juices (bacon fat) accumulated in skillet. Whisk to combine. 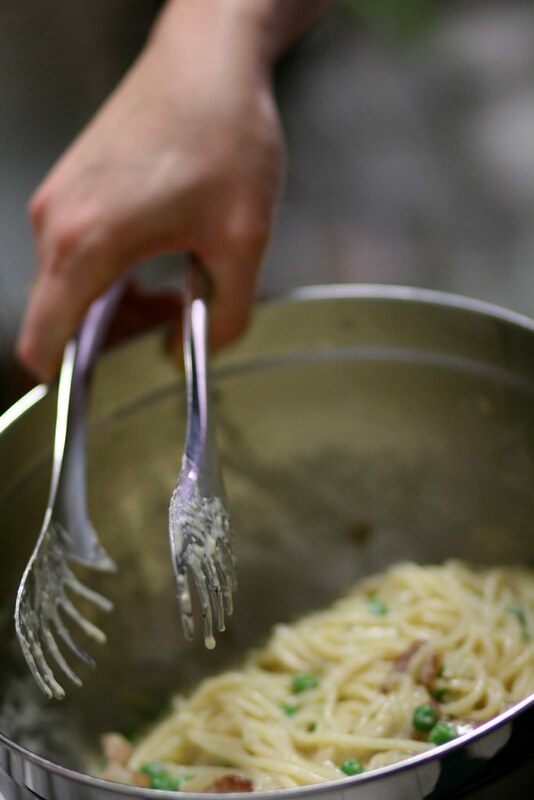 Before draining pasta, add 1/4 cup of pasta cooking water to the mixture in the bowl. Mix in. Top with additional black pepper and serve. 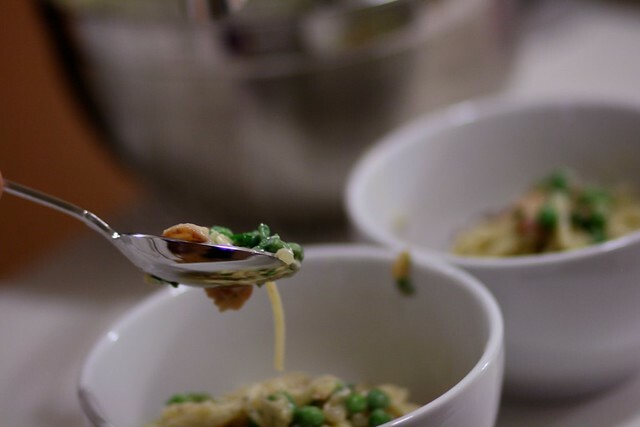 I know I've shared this recipe on here before, but as you're starting to realize, we eat the same things fairly regularly, and after banishing this dish from our diets pre-wedding last winter, I am welcoming it back with open arms and stretchy pants. : ) You crack me up!